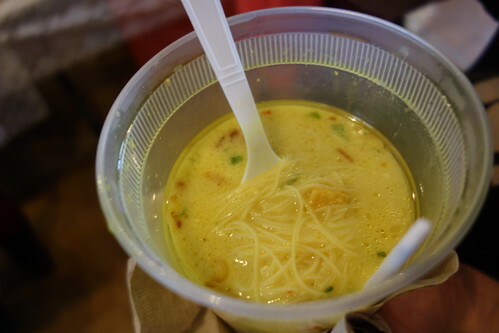 On the side of the dimly lighted, cavernous room opposite the door, one of the first tables was staffed by several generations of women ladling soto babat, a yellow tripe soup with glass noodles, into quart-size plastic containers. 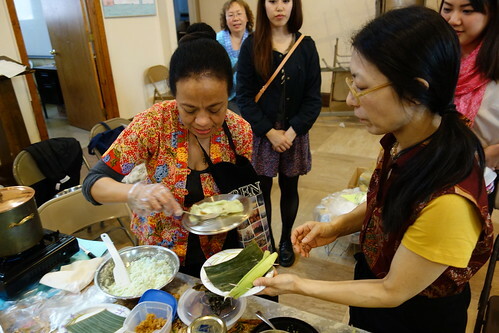 These folks also offered a great wingko babat, chewy squares of coconut and glutinous rice flour, not as hard as the still good version offered at Java Village in Elmhurst, Queens, which are in the more traditional medallion shape. 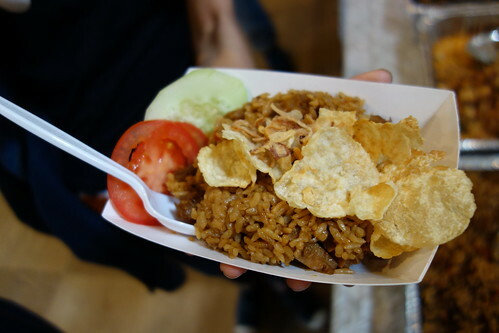 Near them was Henricus Kusbiantoro, a famous Indonesian designer and his wife, both organizers of the event, who cooked up a fairly authentic nasi goreng babat, beef tripe fried rice served with a slice of tomato and cucumber and garnished with emping, a cracker made from crushed melinjo nuts. 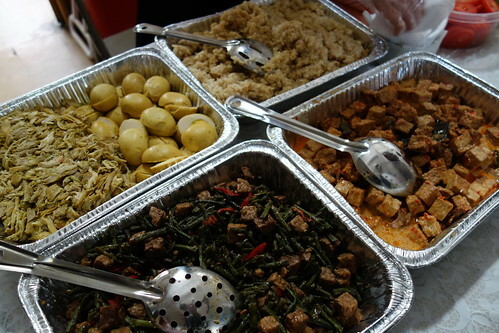 The Kusbiantoros also offered a four-tray combo dish called nasi bogana, the base of which is nasi liwet, rice cooked with bay leaves and turmeric. Neighboring trays held shredded spiced chicken breast cooked with spiced boiled eggs called telur pindang; tofu with chilies, coconut milk, galangal, and turmeric; and finally, a long bean and tempeh dish called oseng tempe kacang panjang. Any or all of these could be chosen to eat with the spiced rice. 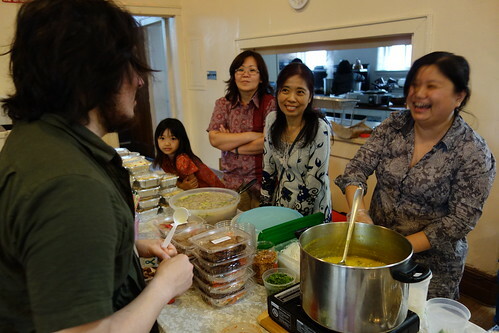 Ambar Mardyat, a chef at Kusuka Indonesian Restaurant in Huntingdon, a town in far west Pennsylvania, put together a huge number of items ahead of time and drove many hours to contribute her effort to the fundraiser. She’s pictured above with her daughter Dani. 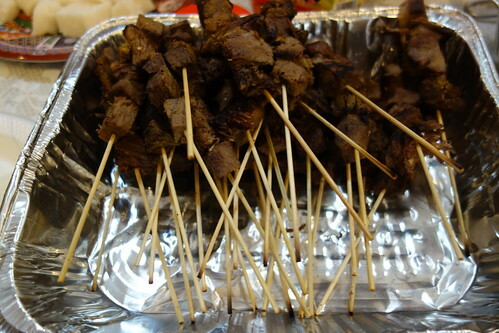 Possibly deserving best of show honors was Ms. Mardyat’s wonderful sate padang, skewers of beef tongue and muscle meat served with pressed rice cubes called lontong, all slathered with a thick, spicy turmeric sauce, with the only downside being its lukewarm temperature, since it wasn’t freshly grilled. One entire table also under her care was given over to a variety of snack foods including rare-in-New York City martabak, a heavy, ground-meat filled square covered with folded phyllo-like dough; lumpia (Indonesian spring rolls); risoles (my favorite), fried croquettes delicately coated with breadcrumbs and layered with a cheesy meat and vegetable mixture; and an array of bakwan jagung, fried corn fritters made with scallions. 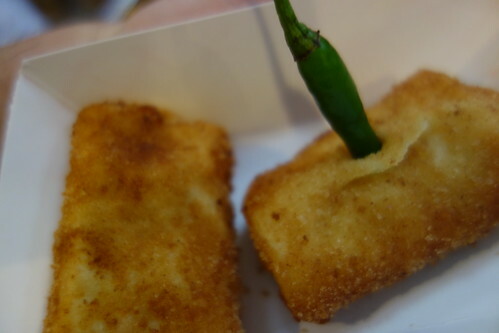 All of these treats are traditionally eaten along with a small green or red chili pepper, taking alternate bites of each. 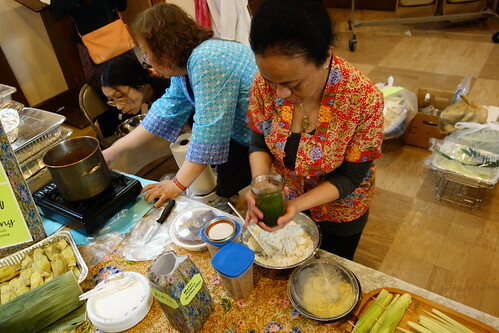 At the back of the room, Mbak Rin had a table devoted to jajan pasar, a class of sweet snacks made with common ingredients that include gula jawa (palm/tamarind sugar), coconut, and rice flour, usually sold in traditional, provincial markets. 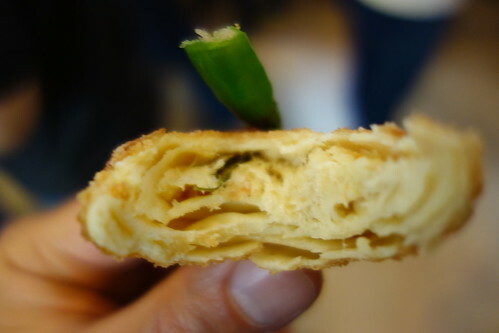 She was giving a cooking demonstration, assembling hers from scratch on the spot, eventually layering palm sugar-sweetened coconut shreds over crumbly, green rice flour pancakes and folding them over before proffering them to onlookers. 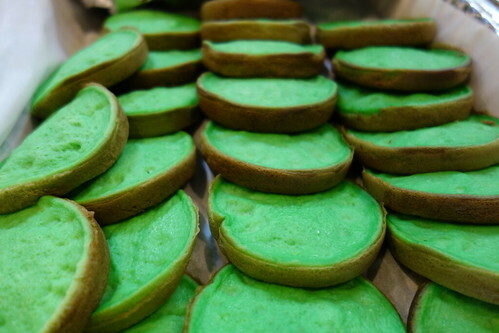 Nearby was a table of serabi, thick coconut milk and rice flour pancakes with a beautiful green color that came four to an order and are also considered to be jajan pasar due to the ingredients used. 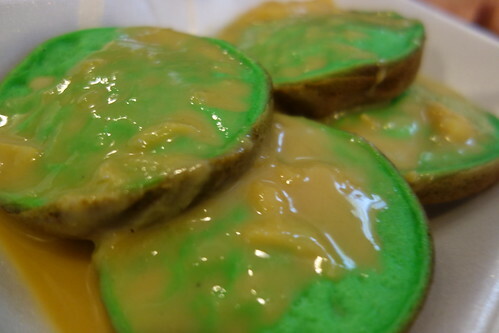 At purchase time, the woman running the table slathered them with a delicious, not overly sweet durian sauce made with coconut milk and palm sugar. These were one of my favorite things on offer. 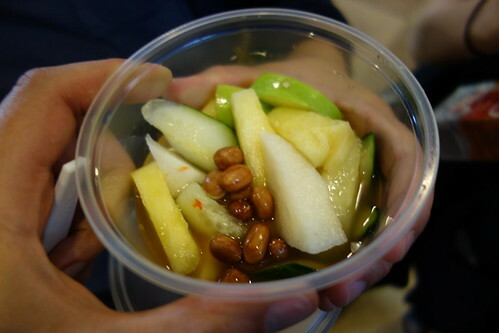 One other notable dish, not normally seen in NYC, was asinan, a refreshing, slightly spicy, sweet, vinegary chopped fruit mixture topped with roasted peanuts. If you feel like you missed out, show up at Masjid Al Hikmah around lunchtime on Sunday and delve into the savory Sumatran offerings. I owe a debt of gratitude to Cecil Mariani for patiently helping me identify things we ate and applying some context to them for me. Cecil is herself an accomplished Indonesian cook and just graduated from the SVA MFA program in design with a dream to change the Indonesian art world through her non-profit organization, Upacita. just some corrections regarding the article, the eggs for Nasi Bogana was not Telur Pindang, but the eggs were cooked together with the same spices as the chicken & rice. 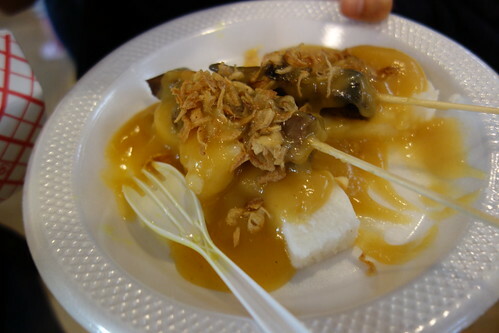 also at mbak Rien’s table, Berdopo-the steamed crepe, made of grated cassava not rice flour. 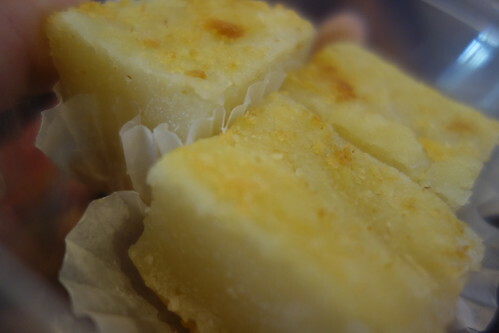 This traditional dessert is similar to Dadar Gulung which is made of rice flour & Berdopo is not as popular as other jajan pasar, that’s the reason mbak Rien & Lilik Gondopriyono decided to preserve this almost forgotten traditional dessert. 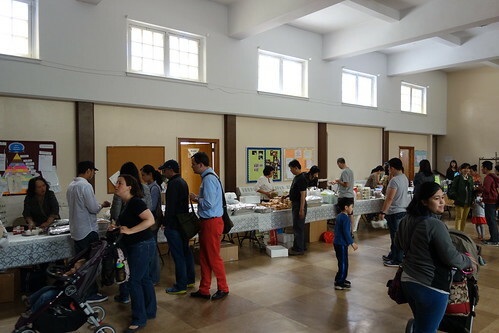 Another thing I forgot to mention, the credits of this event goes to the main organizer-Esther Liestyowati, others who involved in the bazaar were volunteers & vendors. All her hard work & effort should be noted for this event. Thanks for the corrections, Elika. I’ll fix the article. 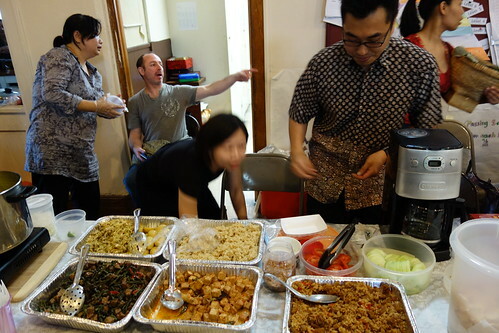 Dear Joe and Peter, thank you for coming and featuring The Indonesian Bazaar at Forest Hills Presbyterian Church in your blog. We truly appreciate it. However, there is something that we feel needs to be clarified. My husband, Henricus Kusbiantoro, and I were not the organizer of the event. 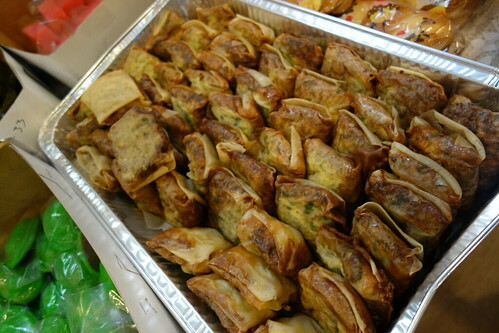 We only help our friends by cooking and presenting our homemade dishes for the event. We don’t deserve the credit. Esther Liestyowati, who was the main organizer and Elika Rosilawati as the assistant organizer are the persons in charge in this event. The credit should go to them. Correction in the article would be greatly appreciated. Thanks again!